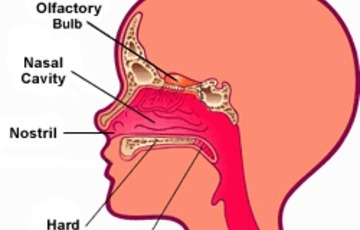 The nose is the body's primary organ of smell and also functions as part of the body's respiratory system. Air comes into the body through the nose. As it passes over the specialized cells of the olfactory system, the brain recognizes and identifies smells. Hairs in the nose clean the air of foreign particles. As air moves through the nasal passages, it is warmed and humidified before it goes into the lungs. The most common medical condition related to the nose is nasal congestion. This can be caused by colds or flu, allergies, or environmental factors, resulting in inflammation of the nasal passages. The body's response to congestion is to convulsively expel air through the nose by a sneeze. Nosebleeds, known medically as epistaxis, are a second common medical issue of the nose. As many as 60 percent of people report nosebleed experiences, with the highest rates found in children under 10 and adults over 50.